Not to be confused with World 5-9. 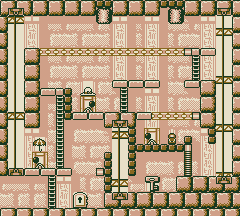 Stage 5-9 is the ninth level in the Desert in the Game Boy version of Donkey Kong. This level is a very big puzzle based level revolving around switchs. Mario starts at the bottom of the level. He needs to climb up the first Ladder to the first switch and pull it to the right to make the Lifts to the left go down, then he must climb up the second ladder and go right over to another lever. Mario must pull the lever to the left to deactivate the bridges so he can go right. He must watch out for the Kurasshā next to the second lever while he runs over to the third lever. Over at the third lever is another Kurasshā to the right of the lever, which he must watch out for to avoid being squashed. He must jump down a hole leading to elevators on the right and the Key to the left. Mario must go to the key and pick it up, then ride elevators to go up. Once it reaches platforms connected by a ladder, he must jump onto them. After that, he must get close enough and wait for the Kurasshā to fall, then he must jump across then go to the left while avoiding the other Kurasshā. He then must go right and make it down to the third lever. Alternatively, he could ride the Kurasshā down when it is falling. Mario must throw the key up to the platform above the lever while he pulls the lever to the left so the bridge blocking the way to the door is deactivated so he can get through (it also closes the door to the key so Mario can't get to it without having the bridge activated). Then, Mario must Backflip up to the platform he threw the key onto and pick it up again. He must then go over to the second lever. Mario must put the key down and pull the lever to the right to activate bridges so he can get across and back down, then he must throw the key up to the platform near the second lever and climb up the ladder. He must then throw the key up again to the bridge, then Backflip up onto the bridge and pick up the key. Mario must then head left, avoiding the first Kurasshā, over to the elevators from before, then he must ride them down. Once he is at the bottom, he must simply go right through the opening to get to the door to end the level. Hat: Above the second switch. Parasol: Above the first lever. Bag: Below the second Kurasshā and next to the third lever.